I was so jazzed when the 25th Anniversary series started to break into cartoon and comic subjects. I had longed for Sunbow specific character designs and exclusive ‘toon personalities since the 80s. When I picked up the wave that contained this Baroness, my excitement quickly subsided. It was simply the Cobra five pack body repainted in blue, and with a new head. 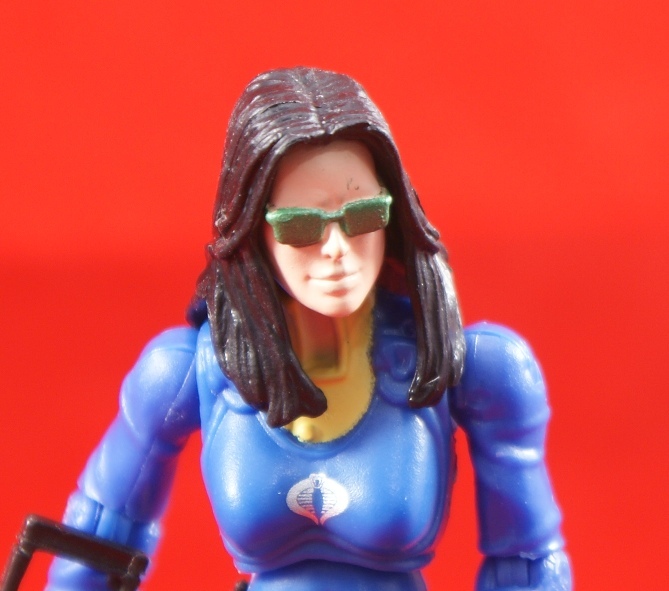 Granted, the head sculpt is an improvement, but the overall figure just isn’t close enough to the animation model (the Baroness’ first appearance blue outfit from the MASS Device) that inspired it. It’s a shame that 2009 set things in motion away from more comic and cartoon figures, especially the female side of Joe media. There just aren’t a whole lot of GI Joe ladies that make it to shelves. If things had kept going deeper into the mythos, who knows what might have been released. I for one would have jumped at the chance for a Candy Appel or Honda Lou West figure. They’ve never done the Baroness in her “true” blue uniform, comic or toon. They haven’t even tried to make reasonable part swaps. The original Scarlett body is somewhat closer to what the Baroness wore but they always repaint the 1984 Baroness costume. I guess they at least made a new head…of course, now she looks like she’d wearing green sunglasses. I was so annoyed when i discovered the 25th stuff wasnt going to be released down here [we atleast not on the primary market]. Would have been nice if she came with a camera gun. Am i the only one who really wants a Honda Lou? 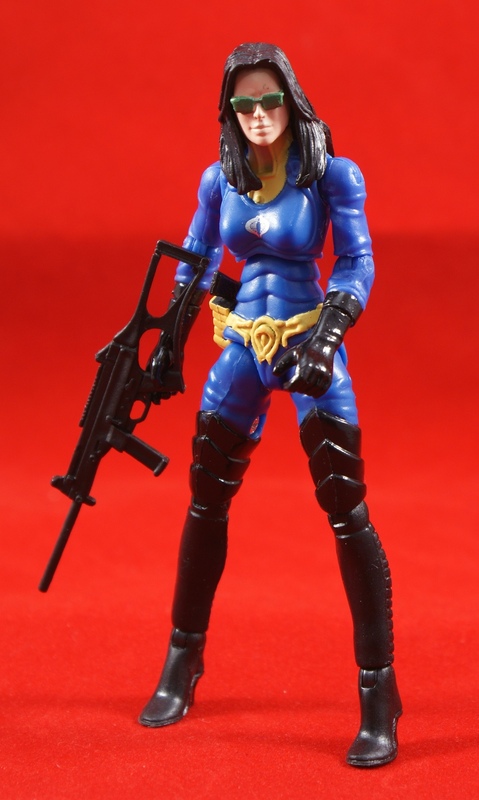 I’d pick this one up for the head sculpt, but I’m not really that much of a Baroness fan to care about whether she is in her original blue uniform or the leather suit Russ Heath first drew her wearing. Nice to know that Hasbro at least tried to give fans an alternative look for her. I think the Baroness figures were probably my least favorite of the 25th anniversary figures. The original is one of my all time faves, and I was stoked to get an updated version, but none of the various 25th releases really hold up.